Phenotype is the total observable physical traits of an individual (organism or cell). Mayr (2001) notes that these observable features include anatomical, physiological, biochemical, and behavioral characteristics. The term can also be used in reference to one particular trait or characteristic that is measurable and is expressed in only a subset of individuals within that population (Brenner and Miller 2002). For example, blue eye color, aggressive behavior, bilateral symmetry, and length of antennae are phenotypic traits. The phenotype of a developing or developed organism is held to be the result of interaction between the inherited genotype (the genetic makeup of the individual), transmitted epigenetic factors (those changes in genome function that do not alter the nucleotide sequence within the DNA), and non-hereditary environmental variation. Some phenotypes are controlled entirely by the individual's genes. Others are controlled by genes but are significantly affected by non-genetic or environmental factors. Still other phenotypes are entirely non-genetic, for example, a person's language or physical traits that were altered by surgery. Each human being has a unique phenotype. Even identical twins, who have the same genotypes, exhibit differences (such as fingerprints or behavioral characteristics) because of non-genetic factors. The process of sexual reproduction, crossing over, mutations, and environmental and other non-genetic influences all help assure that individuals throughout history are each unique. Religions also emphasize the importance of one's spiritual aspect (soul, spirit) and spiritual environment (such as the history of past actions) as influences on the nature of a person, versus an over-emphasis on genotype and physical influences. From the point of view of religion, as a unique manifestation of God's nature, each person can offer a unique joy to God and to others. Geneticists use easily observable phenotypes to deduce an organism's genotype, and analyze complex phenotypes to help hypothesize about how individual genes function. A genotype is the genetic makeup (set of genes) of an individual organism or cell. Genes are the units of heredity in living organisms and are encoded in the organism's genetic material—those segments of DNA that cells transcribe into RNA and translate, at least in part, into proteins. An organism's genotype is a major (the largest by far for morphology) influencing factor in the development of its phenotype, but it is not the only one. For many traits, the genotype may set the potential and limits for phenotypic expression, but environmental influences can be major. Although there has been an historical debate regarding the prominence that should be given to "nature" (genes) versus "nurture" (environment), the consensus is that most characteristics of an organism are affected by both factors (Mayr 2001). For example, the presence or absence of nutrients will affect plant growth and health. The phrase norm of reaction refers to the amplitude of variation of a phenotype produced under different environmental conditions (Mayr 2001). Many phenotypes also are determined by multiple genes. Thus, the identity of one or a few alleles of an organism does not always enable prediction of its phenotype. Even two organisms with identical genotypes normally differ in their phenotypes. One experiences this in everyday life with monozygous (i.e. identical) twins. Identical twins share the same genotype, since their genomes are identical; but they never have the same phenotype, although their phenotypes may be very similar. This is apparent in the fact that their mothers and close friends can tell them apart, even though others might not be able to see the subtle differences. Furthermore, identical twins can be distinguished by their fingerprints, which are never completely identical. Of course, personality differences can be substantial. The concept of phenotypic plasticity describes the degree to which an organism's phenotype is determined by its genotype. A high level of plasticity means that environmental factors have a strong influence on the particular phenotype that develops. If there is little plasticity, the phenotype of an organism can be reliably predicted from knowledge of the genotype, regardless of environmental peculiarities during development. An example of high plasticity can be observed in larval newts—when these larvae sense the presence of predators, such as dragonflies, they develop larger heads and tails relative to their body size and display darker pigmentation (Buskirk and Schmidt 2000). Larvae with these traits have a higher chance of survival when exposed to the predators, but grow more slowly than other phenotypes. In contrast to phenotypic plasticity, the concept of genetic canalization addresses the extent to which an organism's phenotype allows conclusions about its genotype. A phenotype is said to be canalized if mutations (changes in the genome) do not noticeably affect the physical properties of the organism. This means that a canalized phenotype may form from a large variety of different genotypes, in which case it is not possible to exactly predict the genotype from knowledge of the phenotype (i.e. the genotype-phenotype map is not invertible). If canalization is not present, small changes in the genome have an immediate effect on the phenotype that develops. Phenotypic variation (due to underlying heritable genetic variation) is a fundamental prerequisite for a population's adaptation to its environment due to natural selection. The "fitness" of an organism is a high-level phenotype determined by the contributions of thousands of more specific phenotypes. 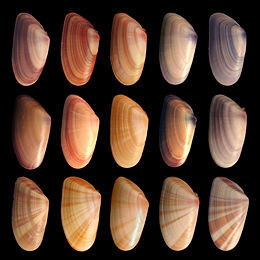 Without phenotypic variation, individual organisms would all have the same fitness, and changes in phenotypic frequency would proceed without any selection (randomly). An example of the importance of random variation in phenotypic expression is Drosophila flies in which the number of eyes may vary (randomly) between left and right sides in a single individual as much as they do between different genotypes overall, or between clones raised in different environments. A phenotype is any detectable characteristic of an organism (i.e., structural, biochemical, physiological, and behavioral) determined by an interaction between its genotype and environment. According to the autopoietic notion of living systems by Humberto Maturana, the phenotype is epigenetically being constructed throughout ontogeny, and we as observers make the distinctions that define any particular trait at any particular state of the organism's life cycle. The concept of phenotype can be extended to variations below the level of the gene that effect an organism's fitness. For example, silent mutations that do not change the corresponding amino acid sequence of a gene may change the frequency of guanine-cytosine base pairs (GC content). These base pairs may have a higher thermal stability ("melting point") than adenine-thymine, a property that might convey, among organisms living in high temperature environments, a selective advantage on variants enriched in GC content. Van Buskirk, J., and B. R. Schmidt. “Predator-induced phenotypic plasticity in larval newts: Trade-offs, selection, and variation in nature.” Ecology 81: 3009-3028, 2000. This page was last modified on 4 April 2008, at 00:01.